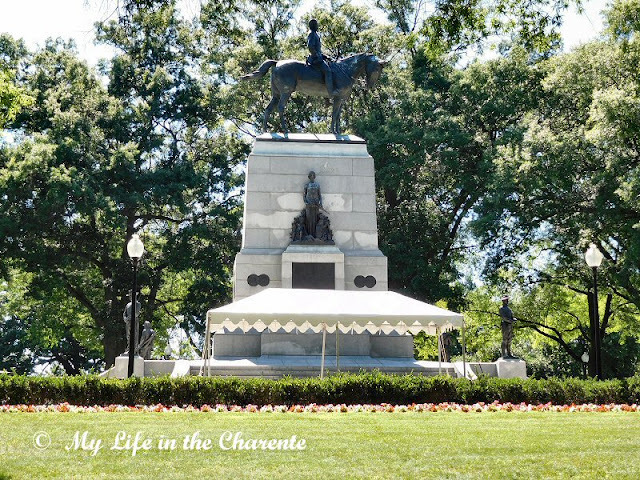 My Life in the Charente: The first of two episodes in a too-short visit to Washington DC - Part 4 of our holiday. 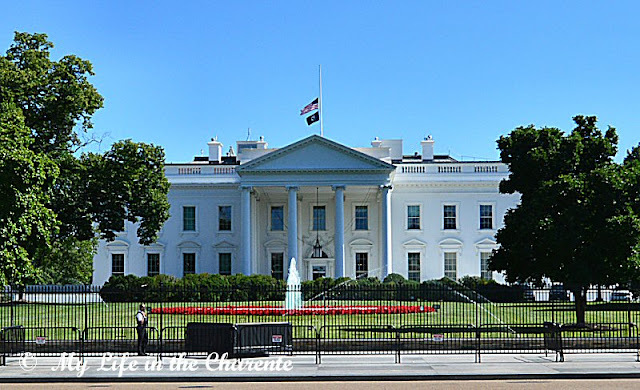 The first of two episodes in a too-short visit to Washington DC - Part 4 of our holiday. Our friend very kindly lent us his car and we drove south from Delaware on the I-95 to the nearby Baltimore Airport, which has a massive multi-storey car park offering easy parking at reasonable rates. The BWI (standing for Baltimore-Washington International, in case you were wondering!) airport has its own dedicated rail station and we caught the train to Washington, as parking in central Washington was said to be next to impossible to find, and expensive if you did find it! On the way, we discovered that American inter-state highways can be very scary for we country folk! To have massive trucks, which travel at the same speed as the cars, bearing down on us at up to 110 kph (70 mph) or more was a nerve-wracking experience until we became more used to it. Overtaking on both sides seems to be permitted, too, so eyes-in-back-of-head are useful! The warning note stencilled on the mirror is very necessary! Our MARC train at the station. The national service, Amtrak has very high fares, just like the UK trains! 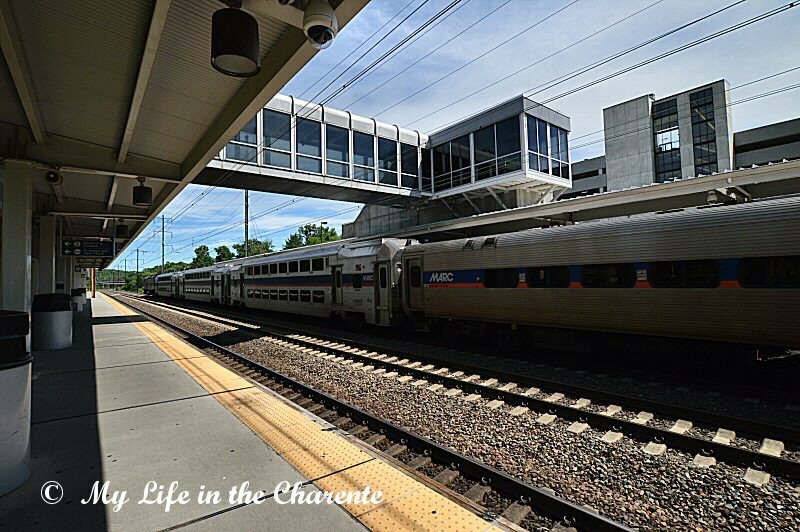 There is however another district train service (MARC) which offers sensible prices, about which our friend tipped us off. We got TWO return tickets on this train for the 45 minute trip to Washington's Union station at the bargain price of $14!! Washington is a city jam-packed with spectacular museums, memorials and monuments; they are scattered everywhere, so it is difficult to visit them all in a short time! On arrival, we soon discovered that the hop-on hop-off bus services (there are several available) give one a good impression of where everything is, and of course, you can break your trip to get a closer look at those sights which interest you! One could spend weeks visiting all there is to see and in hindsight we could have stayed a lot longer! However, we tried to fit in as much as possible in the three days we had, but we really only scratched the surface! Here are some views....... in no particular order, or importance! 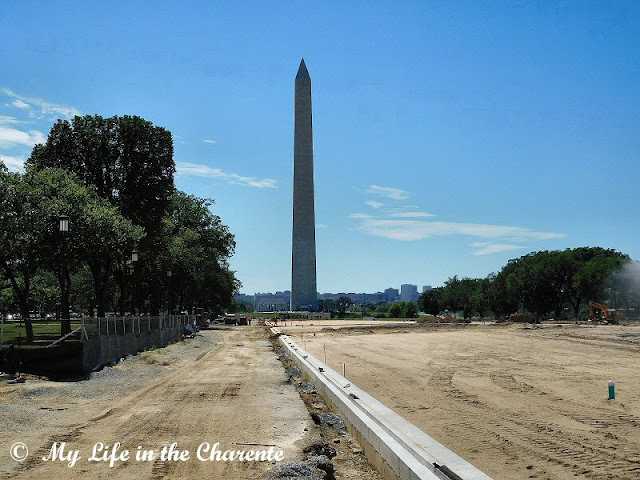 The National Mall with Washington Monument - under construction! No grass to be seen and temporary fencing everywhere! What a disappointment for tourists; how the authorities could do this in the high tourist season and why they didn't do it in phases so visitors could access some of it at least, is hard to believe!! Tip: stay away from Washington until summer 2017 by which time the work should be finished! In Lafayette Square Park, a 7 acre space just north of the White House, there are several monuments to both American and foreign war heroes. This one from 1853 celebrates Andrew Jackson, the seventh president of the US and a national hero after he defeated the British in 1812 at New Orleans. How times change! 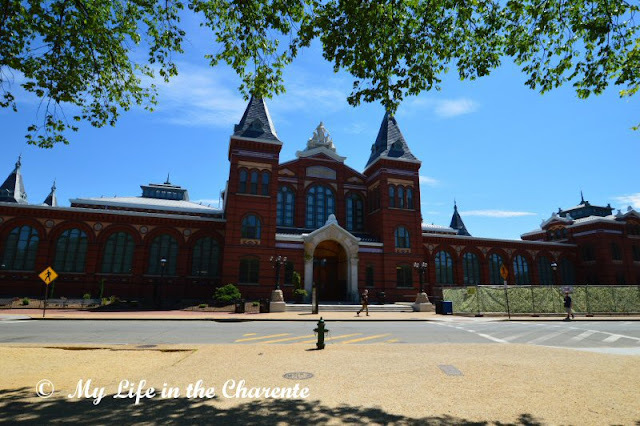 The Smithsonian Institution " the Castle" is built in red sandstone from the state of Maryland, giving it its striking appearance.Smithson was a British chemist who bequeathed his fortune to the United States! More evidence of Smithson's legacy later! The White House needs little commentary. There was obviously a security operation in action when we were there and squads of Secret Service personnel appeared almost from nowhere to clear the large crowds of pedestrians from the area. That's why there is only one person (a security man) in this normally crowded scene! The 19th (yes,not a typo) and latest in the long line of Smithsonian museums, the National Museum of African American History and Culture opens later in September 2016. There are about 8,000 square metres (85,000 sq feet) of exhibition space, including 3,000 objects,185 videos and 13 different interactives to try. The bronze and granite Albert Einstein statue, outside the National Academy of Sciences in Constitution Avenue, was built in 1979, the centenary of his birth. The signboard is headed "The Celestial Map" It is said that if you rub his nose, a bit of knowledge will be transferred! See the mark? Next door to the Natural History Museum on Constitution Avenue, the American History Museum does what it says on the tin! It houses exhibitions on all aspects of American daily life, including histories of technology, invention and innovation, business and consumerism, music, and popular culture. The Federal Reserve building. "The Fed" as it is commonly called, carries out functions similar to other central banks, like the Bank of England for example, setting interest rates and financial policies. 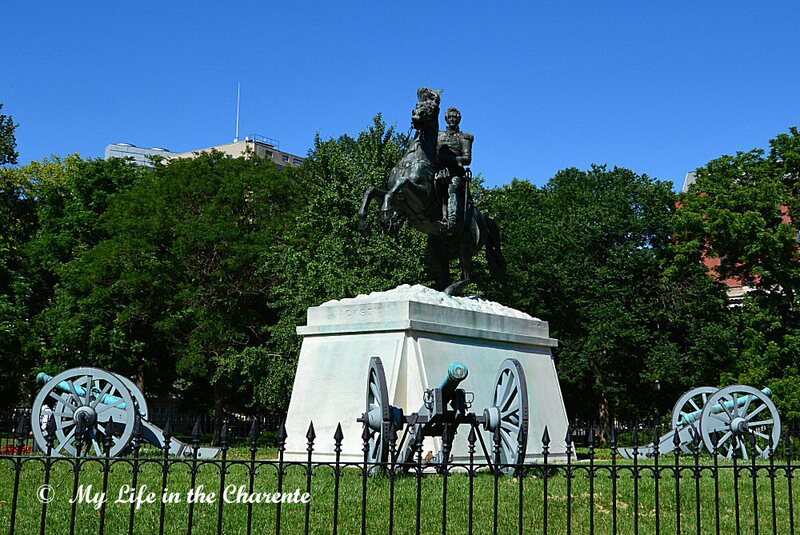 The statue of the Marquis de Lafayette, also in Lafayette Square Park, was installed in 1891. The Marquis was a hero of the American War of Independence (1775 - 1783), providing French assistance to the Colonies in their war against the British. The Lincoln Memorial is set at the far west end of the National Mall and was dedicated in 1922. It has been the site of many famous orations, of which the "I Have a Dream" speech by Martin Luther King is one. Designed by Henry Bacon, the monument features 36 seven feet diameter columns (one for each of the US states during Lincoln's presidency). Outside the Natural History Museum is this eye-catching Central American sculpture of an Olmec ruler. One of 17 similar heads discovered in the area, the 6 ton original is made of basalt and was sculpted without iron tools or the use of wheels! It was excavated in 1946 by an archaeologist from the Smithsonian and is on display in a museum in Veracruz.This one is actually a replica, made in Mexico from volcanic rock and presented to the US government in 2001 by the Mexican state of Veracruz. American Civil War, fighting for the Union cause. The artist commissioned to design the monument unfortunately died in 1900, before it could be completed, but it was however finished in 1903 through the efforts of several contemporary sculptors employed by his widow. The US Capitol, which is the seat of the US Congress - yet more scaffolding, which apparently will be removed in early 2017! The complex sits on Capitol Hill at the east end of the National Mall. It was originally completed in 1800, but extensions, including that unmistakable dome, were added later. A tranquil view north, snatched from an upstairs seat on the bus(! 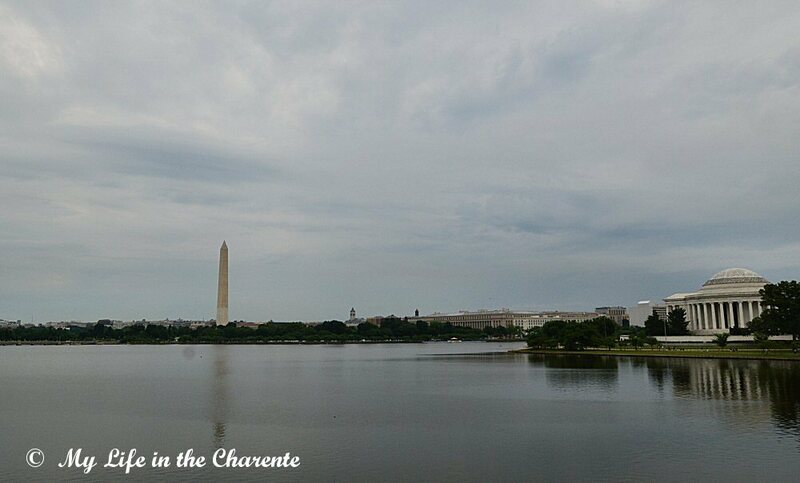 ), across the Tidal Basin, with the Washington Monument ahead in the distance and the circular Thomas Jefferson Memorial on the right. Finally a close-up of the Washington Monument; the centrepiece of the National Mall and at 169 metres (555 feet) it is both the tallest structure in the city and the tallest stone structure in the world. Construction started in 1848, but in 1854 the funds ran out and work only restarted in 1877, by which time the new stone had to come from a different source. The colour change in the photo shows where this took place! The needle was finally finished in 1888 and there's now a lift in the middle! Visitors are allowed in limited numbers every day on a first come-first served basis. Damaged by both an earthquake and hurricane in 2011, it reopened in 2014. The second and final episode of our Washington experience will focus on probably the most popular Smithsonian museum - Air and Space! I can't believe that maybe - just maybe I'm the first to comment on your sooo popular blog. Anyway I just wanted to say that Australia has the same scary thing with trucks. France (europe) is so much more enlightened when it comes to limited speeds and keeping in the slow lane for trucks. I don't know what the statistics say for you guys but we have heaps of accidents involving trucks. Hi Leon, ha ha you nearly made it but Hilary was one step ahead of you! Because I blog 'slowly' nowadays it seems to take people longer to realise that I have written a blog!! I understand SCARY these days as our life in the country is less frantic and driving in Melbourne is much more hectic. I'm over it. Awww I didn't know that you visited US Diane. You know I haven't had the chance to go to Washington and explore, you beat me to it lol. There is a vast difference in the train fare options and prices. Good thing your friend tipped you off. It sounds like you had a jam packed 3 days in Washington. I've yet to travel there but probably would pick the Fall season for such a trip just because I like the cooler air for the sightseeing. Happy and safe travels, Diane! Glad you're enjoying your trip, Diane! And I can sympathize with the inter-state highways, those trucks are pretty scary sometimes, esp. here by us in Chicago with 10 or more lanes. I've been to DC but have never seen the Gen Sherman statue and was surprised to see your photo of it. He was born in Lancaster, Ohio which is the area where I was born. His home, etc. are all a museum there. Learn something new every day! And I see you visited Las Vegas. Woo hoo! So glad you are visiting the states! Washington D.C. is a beautiful place. You are right it is impossible to see it all. 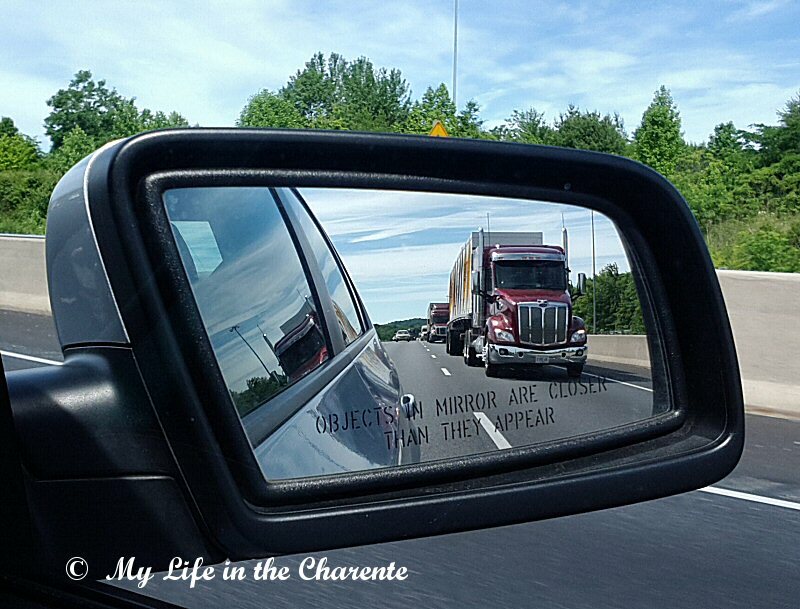 Oh, and those trucks....they typically drive on the right but will pass lanes. they are huge. They can be very unnerving. Hope you continue to have a fabulous time! Even with little time you saw quite a bit. Heck I've never been to Washington DC. And although I rarely visit cities I do have a desire to tour at least some of the Smithsonian. Too bad about all the construction. It is an amazing city with all those memorials. The Remembrance Pool was dug up when we were there. Passing on the right is illegal, but unless there's a state trooper around, people do it anyway, rather than sit behind a slower car in the left lane, honking to get him to move over. The trucks are scary, but there's no other practical way to transport around the consumer goods (including food) that we need. It is a shame that all of the renovations were ongoing while you w3ere there, but each stage of a landscaping project has to be finished by late September or early October in order to have time to root before winter. My oldest son recently had business in Washington, so he and his wife and baby took the train from Connecticut through New York City and down to DC. It's a very nice way to travel between those big Northeastern cities, and I'm glad your friend was able to point you to the bargain fares. Looks like you enjoyed this leg of the trip, too, and seemingly Nigel adapted to our roads with ease. Your experiences regarding traffic is identical to my own when I arrived here 40 years ago and having lived in a very small village before. We have traveled around the country and lived in several places and are now back where we started from. I remember having to drive into DC to pick up friends from the train station, and other times doing something else, and remember my father-in-law saying that now I could drive in DC, I could drive anywhere. Funds for the Smithsonian was donated by a founding donor, an Englishman named James Smithson, who never set foot in America. He spent the latter part of his life in Genoa, Italy and passed away there. Many years later Alexander Graham Bell, of the telephone fame, went to Italy and brought Smithson's bones back to be interned at the Institute. I always thank Mr. Smithson every time I step inside one of the museums because I absolutely love visiting them. So glad you enjoyed your visit even with all the upheaval. It is lovely seeing it through a visitor's eyes. Hope it all healed well ! Shins are very painful parts of the body! I enjoyed visiting Washington with you.....will not ever visit in person, but nice to have a 'look see' through someone else's eyes! Merci Diane de nous faire voyager avec vous! Vos récits sont très intéressants!Comme toujours! Lovely post, it looks like Washington has changed quite a bit since my last visit! I too hate winter and getting cold now is not my cup of tea! 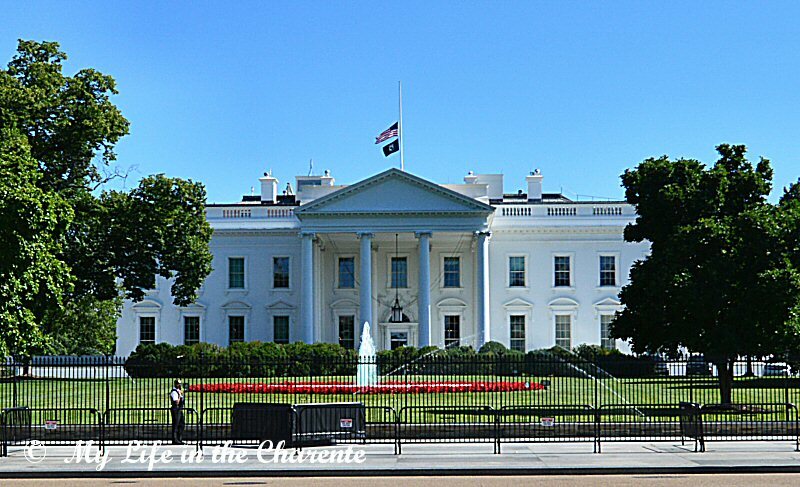 I am an American and still have never been to Washington, D.C. - it's on my bucket list! Great pictures Diane.